Best for: Those looking to unplug and be inspired away from it all. Not for: Anyone not up for collective eating, walking and hanging out. 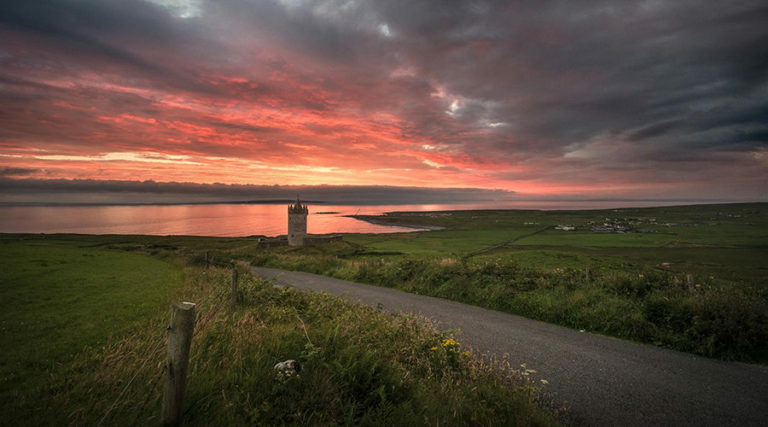 The Cliffs of Moher Retreat is a retreat centre a mile from the beach on the wild Atlantic coast of the west of Ireland, near Liscannor in County Clare. Come here to take time out of everyday life and experience yoga, meditation, walking and wellness guidance, far from the madding crowd and inspired by one of Ireland’s most beautiful regions, at the mid-point of The Wild Atlantic Way, a 400-kilometre stretch along Ireland’s rugged western coastline. Energy is boosted throughout by delicious and varied vegetarian meals eaten together in the dining room, and the outdoor wood-fired hot tub is perfect for star-gazing, even on chilly nights. Owner and lead yoga teacher Michelle Moroney also runs Yoga Teacher Training courses here. The positive energy and warmth generated by host and owner Michelle Moroney and her team. When leading the retreat, Michelle eats meals with the group, which also allows guests time to ask her questions about yoga practice or injuries that they’d like advice on. She also knows the local area intimately, and can advise on everything from the best places for sea swimming to where to get the best cup of coffee! There’s Ecover hand soap in the rooms, but other than that no toiletries are provided, nor are facilities to make hot drinks. The weather in the west of Ireland can be volatile. 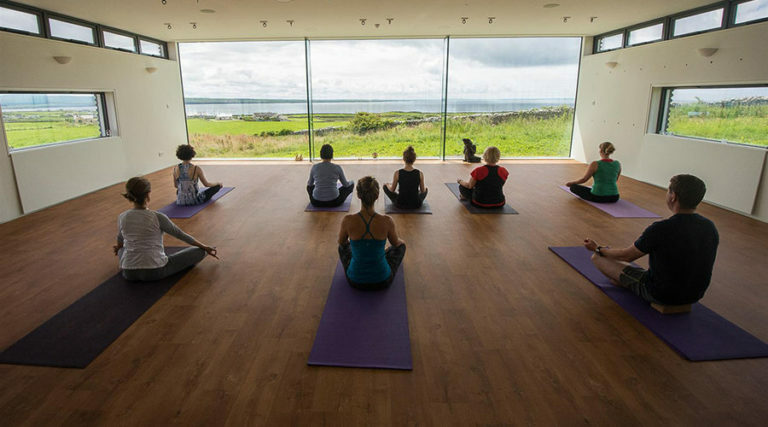 Catherine O’Rawe reviews a Residential Yoga Weekend at the Cliffs of Moher Retreat on the wild Atlantic coast of Ireland and finds an inspiring mix of yoga, meditation, relaxation, good company, surfing and rugged coastal walks. Come here for group retreats themed around yoga, meditation, walking and hiking, and wellness. On most retreats, the morning begins with a 30-minute meditation session in the studio at 7.30am. Mixing guided meditation with silence, it is a perfect way to wake up and to prepare for breakfast. On residential yoga retreats there is always a 90 minute class the first evening and then two, 2-hour classes during the day, with an additional 2 hour class on the departure morning. Yoga classes are also incorporated into the other retreats, such as the Be Whole Health and Wellness Break, and the Yoga and Hiking weekends. All levels of yoga experience are catered for, and you can usually expect more dynamic classes in the mornings, and floor-based, restorative sessions in the evenings, in the beautiful Atlantic-facing studio lit by candles. Bolsters and other props are available, and the studio has the inlets for an Iyengar Yoga Wall and the mechanics and space for 18 hammocks for Anti-Gravity/Ariel Yoga. Michelle Moroney, owner of the retreat and a senior yoga teacher, takes many of the retreats, and we love her teaching, especially her use of humour to help you tap into our previously unknown reserves of willpower. Michelle began studying yoga in Thailand and India – her initial training was at the Sivananda Yoga Ashram in the Himalayas, India, and she did further training in Dublin. She has been teaching yoga since 2004, and also offers yoga teacher training courses here. Michelle teaches a variety of styles, including yin yoga, while some retreats are taught by invited expert teachers such as Dearbhla Glynn, who teaches vinyasa, yin and restorative yoga. The retreat offers Be Whole Health and Wellness Breaks once a month for anyone looking to make a lasting lifestyle change. 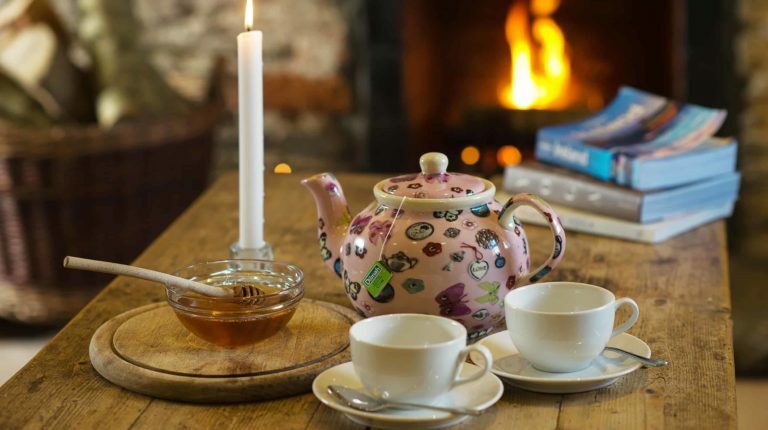 These retreats include cookery classes, nutritional advice and short juice cleanses as well as yoga, meditation and relaxation to help you to lead a healthier and happier life on return. There’s a strong focus on taking responsibility for yourself, and motivational guest speakers such as mindfulness teacher, coach, and facilitator Mari Kennedy. Whatever retreat you are on, you can use the lovely outdoor hot tub and sauna, and book different types of bodywork including deep tissue, Swedish and healing massage. Local masseuse Dara offers massages in the treatment room off the studio; these are available during your free time and it’s usually best to book in advance. One of the main attractions of the retreat is its location at the mid-point of The Wild Atlantic Way, a 400-kilometre stretch along Ireland’s rugged western coastline, and there is fabulous walking to be had along the cliff coastal paths, through the countryside or along the beach. Retreats are offered that mix yoga with longer nature hikes, which are usually around 8km each and along the cliff coastal paths north and south of the Cliffs of Moher Visitor Centre. On most retreats too, after breakfast each morning, there is a ‘silent walk’, where participants are encouraged to be silent and engage with nature on lovely walks led by Michelle and her dog Moher. 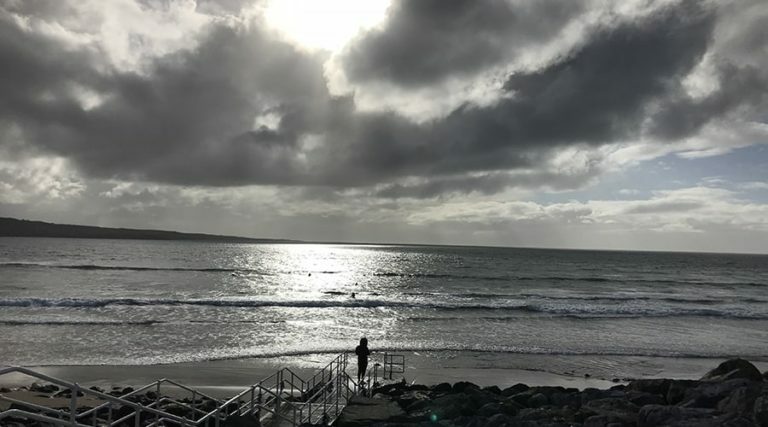 If you have free time, you can arrange a surfing lesson (at extra cost) at Lahinch’s renowed beach, where wetsuits enable you to brave the freezing Atlantic all year round. Hardy souls can also join those who, like Michelle, venture in for a bracing swim. If you’re into cycling, you can hire bikes in Doolin (a 15-minute drive from the retreat centre) to explore the area on two wheels. The main reception area is the only part of the centre that has wifi. Other than that, you’re encouraged to switch off your devices for the duration of the retreat, which is just a five-minute walk from the nearest beach. 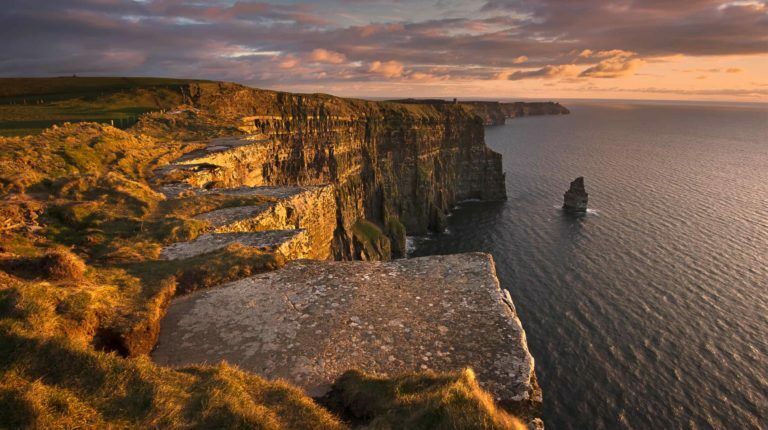 As well as fabulous coastal, beach and countryside walks, you can also take a boat cruise below the Cliffs of Moher on the free afternoon and visit the rugged Cliffs themselves, which are just ten minutes up the road from the retreat centre. They’re one of Ireland’s most popular tourist attractions – Michelle recommends you visit in the early mornings to avoid crowds. 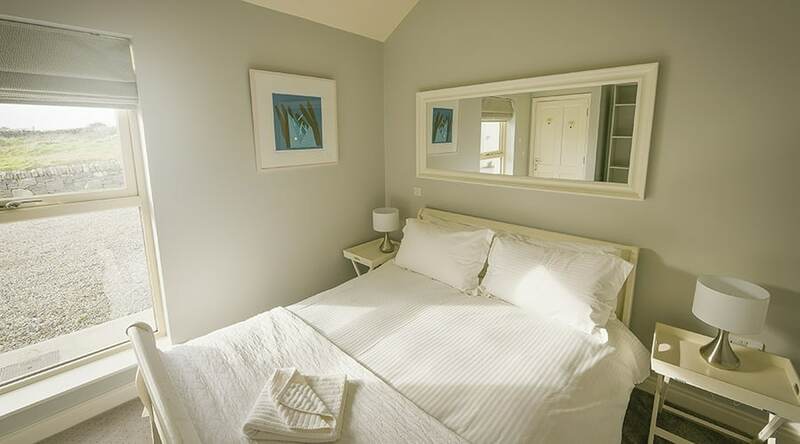 Bedrooms: The retreat’s 14 bedrooms are divided among the five houses that make up the retreat. All feel crisp and clean, with deep mattresses and simple furnishings such as a wooden dresser and a chair. Rooms are generally decorated in soothing neutral or white tones, with splashes of colour provided by a striped chair cushion or a picture. All ensuite rooms have bathrooms with showers. 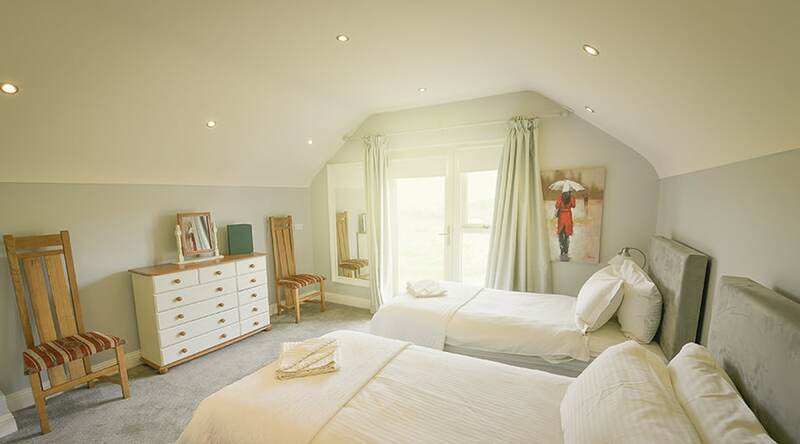 Two rooms – a single and a twin – share a bathroom in the hall, which has a bathtub and shower, and there’s a quad room which has a large bathroom in the hall with a shower. Ecover hand soap is provided, but you need to bring your own toiletries. Most rooms will have a view of the sea. 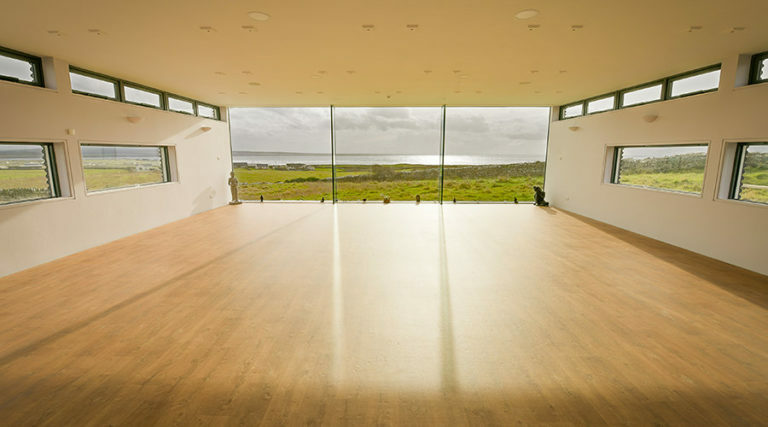 Other spaces to be: When the delightful, sea-facing yoga studio is not in use for classes, guests can come and relax, practise or meditate here. You can also relax in the sauna, in the hot tub, or in the conservatory on the ground floor of the Atlantic Lounge house. Pack for a mixture of weather conditions, and bring wellingtons or hiking boots if you can. It is going to be quite difficult to get around if you don’t bring a car, though local taxis are available, and other guests are generally happy to give lifts. Bring a swimsuit, handy for the hot tub, but also for swimming in the sea, and wearing under a wetsuit if you decide to have a surfing lesson. There are retreats all year including bank holidays, Easter and New year, though they are closed over Christmas. February and March are a bit quieter than other months. The climate in the west of Ireland is changeable and unpredictable – on our early Spring visit, it was a real mix of sunshine and showers. The houses: There’s a main reception area with three huge sofas which is the only part of the centre that has wifi, and the retreat is made up of five modern houses, each with a shared communal area that is open to all guests. A roaring fire in the hearth of each lounge greets visitors when they first arrive and these are also lit in the evenings during chillier months. Comfortable sofas allow you to relax, and musical instruments such as a piano, guitar and harp offer the chance for talented guests to unleash their creativity. The décor and colour schemes in each house are eclectic and vary from room to room: one room might have walls of local brick, including the fireplace, while the main reception room has two enormous sofas in purple velvet for lounging on. The mixing of fabrics, textures, and colours gives a traditional but creative feel, and is never jarring. Several striking and vivid contemporary artworks by contemporary Moroccan painter Abdellah Hamimoune draw the eye in the dining room and lounges. The yoga studio: The yoga studio is the jewel in the crown of the retreat. 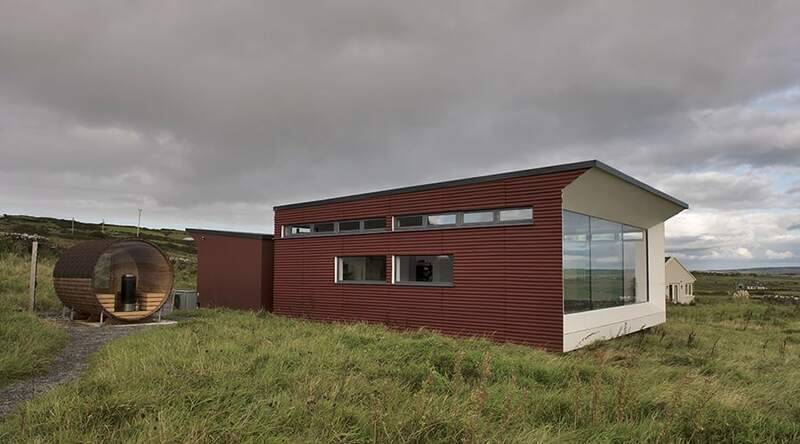 It faces directly out to Liscannor Bay, with a floor-to-ceiling window spanning 10m x 3m to take in the sea view. Underfloor heating and a variety of lighting options make it a cosy and atmospheric space, and it is fully stocked with mats, bolsters, blankets, and bricks. 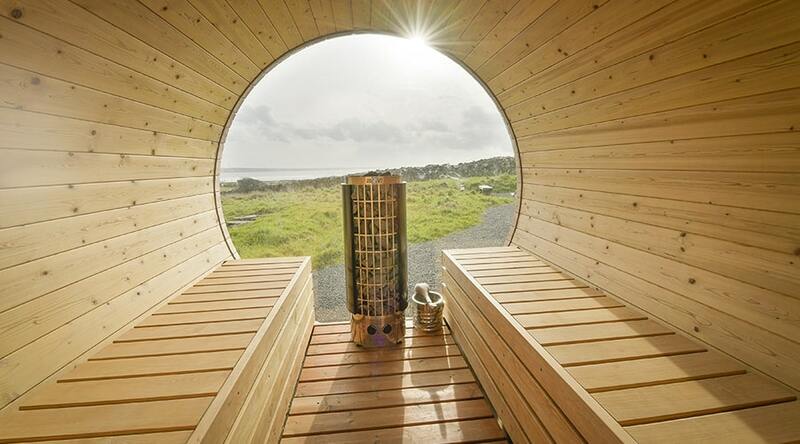 Spa facilities: The sauna is outdoors, but enclosed, and has a sea view. 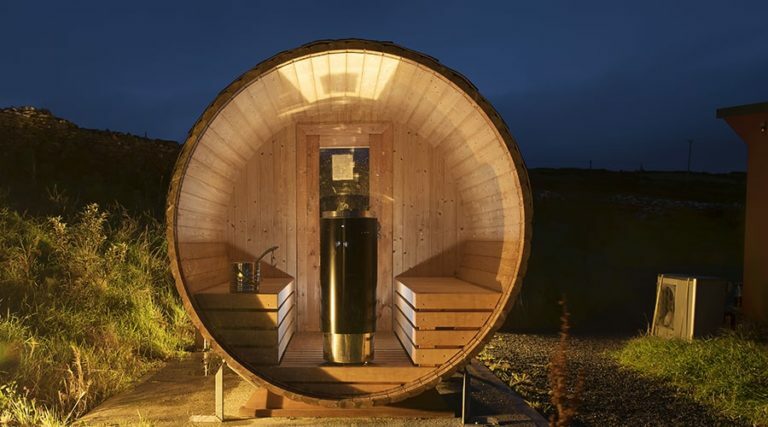 The hot tub will be fired up if the weather permits – it can hold up to 12 people, and is perfect for star-gazing on a chilly night. Treatments take place in a beautiful little room just off the yoga studio. Lit with candles and decorated in the same creative style as the main houses, the room feels tranquil and relaxing. 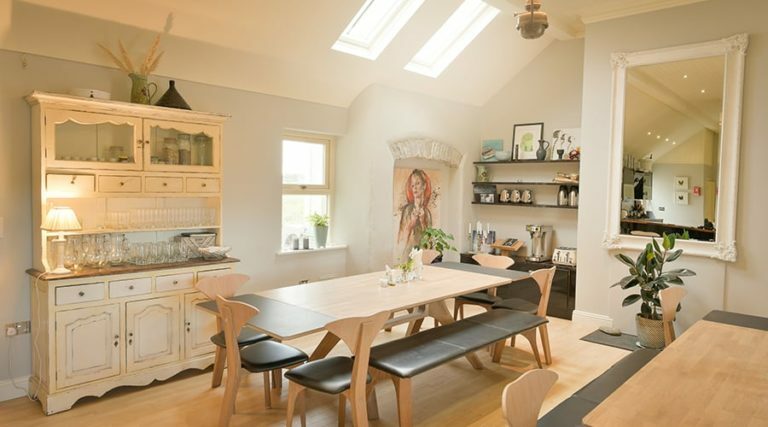 Breakfast, lunch and dinner are enjoyed in an elegant, open-plan kitchen and dining room in one of the houses with high ceilings, a wood-burning stove and under-floor heating. The room has a huge wooden table as its centrepiece, lovely artwork and fresh flowers add decorative touches, and the chefs are on hand during meals to chat about what they’ve prepared. Everything is organic, locally sourced (or sourced on site) and vegetarian. 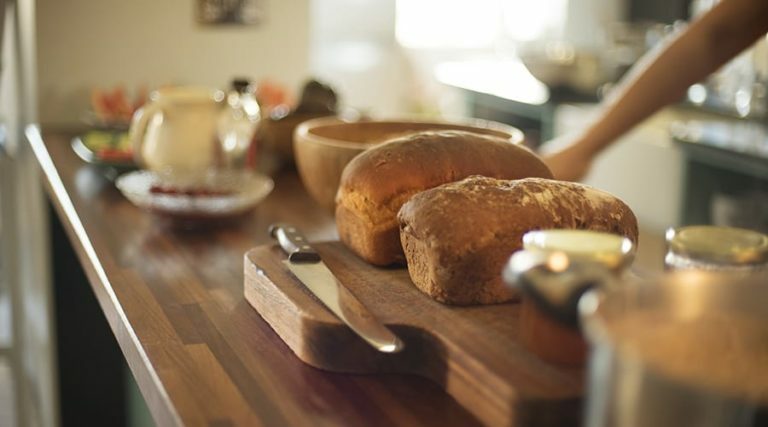 Breakfast features fresh bread, cheese, porridge and fruit, with copious amounts of Ariosa coffee, produced in Ireland, or herbal tea. Some big culinary hits during our stay for lunch and supper were the beetroot and feta burgers, the Moroccan lentil soup, and the raw cashew and raspberry cake for dessert. 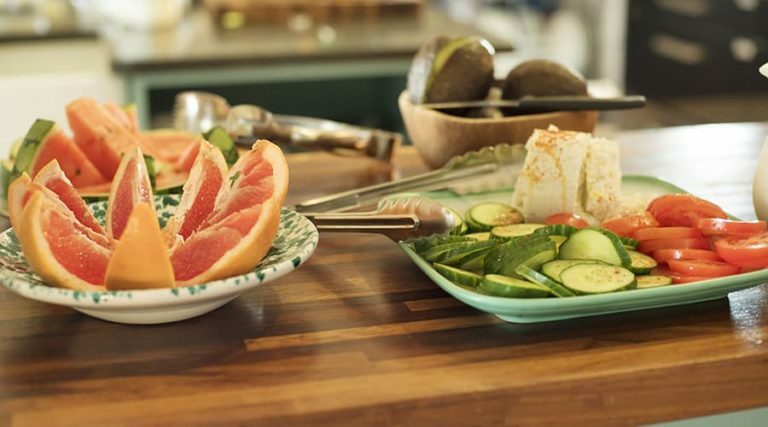 If you fear it is all too healthy, sweet treats such as homemade brownies and power balls are provided on arrival, and desserts are served with every meal. There are tea and coffee-making facilities so you can make a cup whenever you like, and the retreat is alcohol-free. 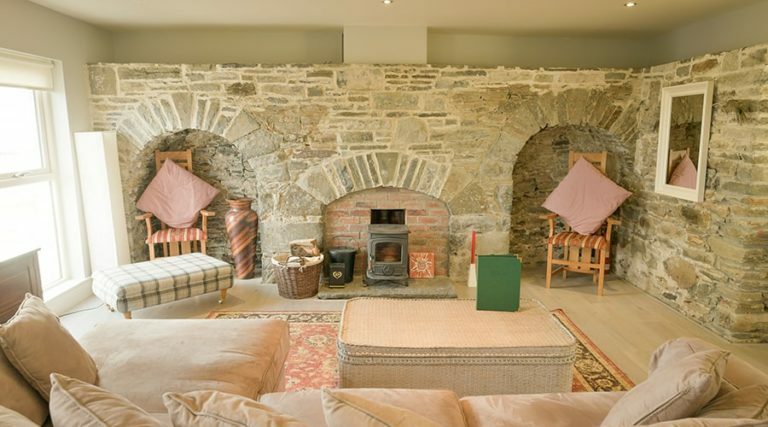 Cliffs of Moher Retreat offers employment to local people in a nurturing environment which allows staff to grow their knowledge of yoga, gardening and general wellness. They grow much of the produce on-site, and the rest is ordered from nearby Moy Community Farm. All food is organically sourced, and food waste is carefully sorted into compostable and non-compostable allotments. They are working on a system to bring the spring well water into the retreat for filtration and consumption.